A familiar face among Yankees fans is set to join another as Jorge Posada will reportedly take on a front office role as a special advisor to Baseball Operations, alongside his former teammate in the Bronx, Derek Jeter, Craig Mish reports. 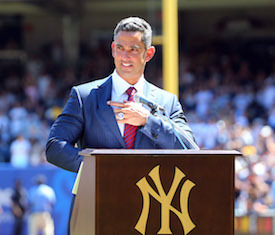 Posada, 47, is a local resident of Miami, and both he and Jeter became close friends over the course of their near 20-year run in the Bronx. Jeter recently made headlines after voicing his impatience with turning the Marlins into a winning baseball team, a process that surely is still in its early stages. "If you come out and say it's going to take us five years, 10 years, 15 years - you're saying it's okay to lose. But that's not the case," said Jeter. "I have no patience. I have zero patience. I've been preaching it. But I don't have it." Perhaps Posada's presence will help accelerate that process for the Marlins, who have finished last in the NL East four of the last eight seasons, despite having a pair of MVP outfielders in Giancarlo Stanton and Christian Yelich for much of that span. One of the biggest topics of discussion this offseason centered around where and when the Marlins would ship out their last premier asset on the roster in J.T. Realmuto, considered the best catcher in the game. There were early discussions between the Marlins and Yankees about a possible Realmuto package that would have sent Gary Sanchez and prospects to the Marlins, but such a deal never materialized. Instead Realmuto will suit up for the Phillies over the remaining two years of his current deal, and the Marlins will hope that their latest shipment of prospects can evolve into the next championship core in Miami. Though the Marlins have fielded some elite talent and captured a pair of World Series titles over the last quarter-century, it appears as though the team won't be ready to contend in an increasingly formidable NL East for the foreseeable future. Jeter had his work cut out for him when he accepted his new role as CEO and part-owner in Miami, but the team appears to be headed in the right direction after a painful roster teardown, and now Posada will be able to lend his expertise and championship pedigree to the equation. Stay tuned for the latest news and developments as baseball's 2019 season gets underway with the official start of spring training this week.